It is desirable to harmonise national measures concerning batteries and accumulators and waste batteries and accumulators. The primary objective of this Directive is to minimise the negative impact of batteries and accumulators and waste batteries and accumulators on the environment, thus contributing to the protection, preservation and improvement of the quality of the environment. The legal base is therefore Article 175(1) of the Treaty. However, it is also appropriate to take measures at Community level on the basis of Article 95(1) of the Treaty to harmonise requirements concerning the heavy metal content and labelling of batteries and accumulators and so to ensure the smooth functioning of the internal market and avoid distortion of competition within the Community. The Commission Communication of 30 July 1996 on the Review of the Community Strategy for Waste Management established guidelines for future Community waste policy. That Communication stresses the need to reduce the quantities of hazardous substances in waste and points out the potential benefits of Community-wide rules limiting the presence of such substances in products and in production processes. It further states that, where the generation of waste cannot be avoided, that waste should be reused or recovered for its material or energy. The Council Resolution of 25 January 1988 on a Community action programme to combat environmental pollution by cadmium (5) stressed the limitation of the uses of cadmium to cases where suitable alternatives do not exist and the collection and recycling of batteries containing cadmium as major elements of the strategy for cadmium control in the interests of the protection of human health and the environment. Council Directive 91/157/EEC of 18 March 1991 on batteries and accumulators containing certain dangerous substances (6) has brought about an approximation of Member States' laws in this field. However, the objectives of that Directive have not been fully attained. Decision No 1600/2002/EC of the European Parliament and of the Council of 22 July 2002 laying down the Sixth Community Environment Action Programme (7) and Directive 2002/96/EC of the European Parliament and of the Council of 27 January 2003 on waste electrical and electronic equipment (WEEE) (8) also underlined the need for Directive 91/157/EEC to be revised. Directive 91/157/EEC should therefore be revised and replaced in the interests of clarity. In order to achieve its environmental aims, this Directive prohibits the placing on the market of certain batteries and accumulators containing mercury or cadmium. It also promotes a high level of collection and recycling of waste batteries and accumulators and improved environmental performance of all operators involved in the life cycle of batteries and accumulators, e.g. producers, distributors and end-users and, in particular, those operators directly involved in the treatment and recycling of waste batteries and accumulators. The specific rules needed to do this are supplementary to existing Community legislation on waste, in particular Directive 2006/12/EC of the European Parliament and of the Council of 5 April 2006 on waste (9), Council Directive 1999/31/EC of 26 April 1999 on the landfill of waste (10) and Directive 2000/76/EC of the European Parliament and of the Council of 4 December 2000 on the incineration of waste (11). In order to prevent waste batteries and accumulators from being discarded in such a way as to pollute the environment, and to avoid end-user confusion about the different waste management requirements for different batteries and accumulators, this Directive should apply to all batteries and accumulators placed on the market within the Community. Such a wide scope should also ensure economies of scale in collection and recycling, as well as optimal resource saving. Reliable batteries and accumulators are fundamental for the safety of many products, appliances and services, and are an essential energy source in our society. It is appropriate to distinguish between portable batteries and accumulators on the one hand and industrial and automotive batteries and accumulators on the other. The disposal of industrial and automotive batteries and accumulators in landfill sites or by incineration should be prohibited. Examples of industrial batteries and accumulators include batteries and accumulators used for emergency or back-up power supply in hospitals, airports or offices, batteries and accumulators used in trains or aircraft and batteries and accumulators used on offshore oil rigs or in lighthouses. Examples also include batteries and accumulators designed exclusively for hand-held payment terminals in shops and restaurants, bar code readers in shops, professional video equipment for TV channels and professional studios, miners' lamps and diving lamps attached to mining and diving helmets for professionals, back up batteries and accumulators for electric doors to prevent them from blocking or crushing people, batteries and accumulators used for instrumentation or in various types of measurement and instrumentation equipment and batteries and accumulators used in connection with solar panel, photo-voltaic, and other renewable energy applications. Industrial batteries and accumulators also include batteries and accumulators used in electrical vehicles, such as electric cars, wheelchairs, bicycles, airport vehicles and automatic transport vehicles. In addition to this non exhaustive list of examples, any battery or accumulator that is not sealed and not automotive should be considered industrial. Examples of portable batteries and accumulators, which are all-sealed batteries and accumulators that an average person could carry by hand without difficulty and that are neither automotive batteries or accumulators nor industrial batteries or accumulators, include single cell batteries (such as AA and AAA batteries) and batteries and accumulators used by consumers or professionals in mobile telephones, portable computers, cordless power tools, toys and household appliances such as electric toothbrushes, razors and hand-held vacuum cleaners (including similar equipment used in schools, shops, restaurants, airports, offices or hospitals) and any battery or accumulator that consumers may use for normal household applications. The Commission should evaluate the need for adaptation of this Directive, taking account of available technical and scientific evidence. In particular, the Commission should carry out a review of the exemption from the cadmium ban provided for portable batteries and accumulators intended for use in cordless power tools. Examples of cordless power tools are tools that consumers and professionals use for turning, milling, sanding, grinding, sawing, cutting, shearing, drilling, making holes, punching, hammering, riveting, screwing, polishing or similar processing of wood, metal and other materials, as well as for mowing, cutting and other gardening activities. The Commission should also monitor, and Member States should encourage, technological developments that improve the environmental performance of batteries and accumulators throughout their entire life cycle, including through participation in a Community eco-management and audit scheme (EMAS). In order to protect the environment, waste batteries and accumulators should be collected. For portable batteries and accumulators, collection schemes achieving a high collection rate should be established. This means setting up collection schemes so that end-users can discard all waste portable batteries and accumulators conveniently and free of charge. Different collection schemes and financing arrangements are appropriate for the different battery and accumulator types. It is desirable for Member States to achieve a high collection and recycling rate for waste batteries and accumulators so as to achieve a high level of environmental protection and material recovery throughout the Community. This Directive should therefore set minimum collection and recycling targets for Member States. It is appropriate to calculate the collection rate on the basis of average annual sales in preceding years, so as to have comparable targets for all Member States that are proportionate to the national level of battery and accumulator consumption. Specific recycling requirements should be established for cadmium and lead batteries and accumulators in order to attain a high level of material recovery throughout the Community and to prevent disparities between Member States. All interested parties should be able to participate in collection, treatment and recycling schemes. Those schemes should be designed to avoid discrimination against imported batteries and accumulators, barriers to trade or distortions of competition. Collection and recycling schemes should be optimised, in particular in order to minimise costs and the negative environmental impact of transport. Treatment and recycling schemes should use best available techniques, as defined in Article 2(11) of Council Directive 96/61/EC of 24 September 1996 concerning integrated pollution prevention and control (12). The definition of recycling should exclude energy recovery. The concept of energy recovery is defined in other Community instruments. Batteries and accumulators can be collected individually, by way of national battery collection schemes or together with waste electrical and electronic equipment, by way of national collection schemes set up on the basis of Directive 2002/96/EC. In the latter case, as an obligatory minimum treatment requirement, batteries and accumulators should be removed from the collected waste electrical and electronic equipment. After their removal from the waste electrical and electronic equipment, batteries and accumulators are subject to the requirements of this Directive, notably they count for achieving the collection target and are subject to recycling requirements. Basic principles for financing the management of waste batteries and accumulators should be set at Community level. Financing schemes should help to achieve high collection and recycling rates and to give effect to the principle of producer responsibility. All producers as defined by this Directive should be registered. Producers should finance the costs of collecting, treating and recycling all collected batteries and accumulators minus the profit made by selling the materials recovered. However, under certain circumstances, the application of de minimis rules to small producers could be justified. The provision of information to end-users on the desirability of separate collection, the collection schemes available and end-users' role in the management of waste batteries and accumulators is necessary for successful collection. Detailed arrangements should be made for a labelling system, which should provide end-users with transparent, reliable and clear information on batteries and accumulators and any heavy metals they contain. If, in order to achieve the objectives of this Directive, and, in particular, to achieve high separate collection and recycling rates, Member States use economic instruments, such as differential tax rates, they should inform the Commission accordingly. Reliable and comparable data on the quantities of batteries and accumulators placed on the market collected and recycled are necessary for monitoring whether the objectives of this Directive have been achieved. Member States should lay down rules on the penalties applicable to infringements of the provisions of this Directive and ensure that they are implemented. Those penalties should be effective, proportionate and dissuasive. In accordance with paragraph 34 of the Interinstitutional agreement on better law-making (13), Member States are encouraged to draw up, for themselves and in the interests of the Community, their own tables, which will, as far as possible, illustrate the correlation between this Directive and the transposition measures and to make them public. The measures necessary for the implementation of this Directive should be adopted in accordance with Council Decision 1999/468/EC of 28 June 1999 laying down the procedures for the exercise of implementing powers conferred on the Commission (14). Since the objectives of this Directive namely protecting the environment and ensuring the proper functioning of the internal market cannot be sufficiently achieved by the Member States and can therefore, by reason of the scale or effects of the action, be better achieved at Community level, the Community may adopt measures, in accordance with the principle of subsidiarity as set out in Article 5 of the Treaty. In accordance with the principle of proportionality, as set out in that Article, this Directive does not go beyond what is necessary in order to achieve those objectives. This Directive applies without prejudice to Community legislation on safety, quality and health requirements and specific Community waste management legislation, in particular Directive 2000/53/EC of the European Parliament and of the Council of 18 September 2000 on end-of-life vehicles (15) and Directive 2002/96/EC. As regards producer responsibility, producers of batteries and accumulators and producers of other products incorporating a battery or accumulator are responsible for the waste management of batteries and accumulators that they place on the market. A flexible approach is appropriate to enable financing schemes to reflect differing national circumstances and to take account of existing schemes, particularly those set up to comply with Directives 2000/53/EC and 2002/96/EC, while avoiding double charging. Directive 2002/95/EC of the European Parliament and of the Council of 27 January 2003 on the restriction of the use of certain hazardous substances in electrical and electronic equipment (16) does not apply to batteries and accumulators used in electrical and electronic equipment. specific rules for the collection, treatment, recycling and disposal of waste batteries and accumulators to supplement relevant Community legislation on waste and to promote a high level of collection and recycling of waste batteries and accumulators. It seeks to improve the environmental performance of batteries and accumulators and of the activities of all economic operators involved in the life cycle of batteries and accumulators, e.g. producers, distributors and end-users and, in particular, those operators directly involved in the treatment and recycling of waste batteries and accumulators. 1. This Directive shall apply to all types of batteries and accumulators, regardless of their shape, volume, weight, material composition or use. It shall apply without prejudice to Directives 2000/53/EC and 2002/96/EC. equipment designed to be sent into space. ‘collection rate’ means, for a given Member State in a given calendar year, the percentage obtained by dividing the weight of waste portable batteries and accumulators collected in accordance with Article 8(1) of this Directive or with Directive 2002/96/EC in that calendar year by the average weight of portable batteries and accumulators that producers either sell directly to end-users or deliver to third parties in order to sell them to end-users in that Member State during that calendar year and the preceding two calendar years. portable batteries or accumulators, including those incorporated into appliances, that contain more than 0,002 % of cadmium by weight. 2. The prohibition set out in paragraph 1(a) shall not apply to button cells with a mercury content of no more than 2 % by weight. 4. The Commission shall review the exemption referred to in paragraph 3(c) and submit a report to the European Parliament and to the Council by 26 September 2010, together, if appropriate, with relevant proposals, with a view to the prohibition of cadmium in batteries and accumulators. Member States which have manufacturers established on their territory shall promote research and encourage improvements in the overall environmental performance of batteries and accumulators throughout their entire life cycle as well as the development and marketing of batteries and accumulators which contain smaller quantities of dangerous substances or which contain less polluting substances, in particular as substitutes for mercury, cadmium and lead. 1. Member States shall not, on the grounds dealt with in this Directive, impede, prohibit, or restrict the placing on the market in their territory of batteries and accumulators that meet the requirements of this Directive. 2. Member States shall take the necessary measures to ensure that batteries or accumulators that do not meet the requirements of this Directive are not placed on the market or are withdrawn from it. Member States shall, having regard to the environmental impact of transport, take necessary measures to maximise the separate collection of waste batteries and accumulators and to minimise the disposal of batteries and accumulators as mixed municipal waste in order to achieve a high level of recycling for all waste batteries and accumulators. may be run in conjunction with the schemes referred to in Article 5(2) of Directive 2002/96/EC. Collection points set up to comply with point (a) of this paragraph shall not be subject to the registration or permit requirements of Directive 2006/12/EC or Council Directive 91/689/EEC of 12 December 1991 on hazardous waste (18). 3. Member States shall ensure that producers of industrial batteries and accumulators, or third parties acting on their behalf, shall not refuse to take back waste industrial batteries and accumulators from end-users, regardless of chemical composition and origin. Independent third parties may also collect industrial batteries and accumulators. 4. Member States shall ensure that producers of automotive batteries and accumulators, or third parties, set up schemes for the collection of waste automotive batteries and accumulators from end-users or from an accessible collection point in their vicinity, where collection is not carried out under the schemes referred to in Article 5(1) of Directive 2000/53/EC. In the case of automotive batteries and accumulators from private, non-commercial vehicles, such schemes shall not involve any charge to end-users when discarding waste batteries or accumulators, nor any obligation to buy a new battery or accumulator. Member States may use economic instruments to promote the collection of waste batteries and accumulators or to promote the use of batteries and accumulators containing less polluting substances, for instance by adopting differential tax rates. If they do so, they shall notify the measures related to the implementation of those instruments to the Commission. 1. Member States shall calculate the collection rate for the first time in respect of the fifth full calendar year following the entry into force of this Directive. Without prejudice to Directive 2002/96/EC, annual collection and sales figures shall include batteries and accumulators incorporated into appliances. 45 % by 26 September 2016. 3. Member States shall monitor collection rates on a yearly basis according to the scheme set out in Annex I. Without prejudice to Regulation (EC) No 2150/2002 of the European Parliament and of the Council of 25 November 2002 on waste statistics (19), Member States shall transmit reports to the Commission within six months of the end of the calendar year concerned. Reports shall indicate how they obtained the data necessary to calculate the collection rate. a common methodology shall be established for the calculation of annual sales of portable batteries and accumulators to end-users by 26 September 2007. Member States shall ensure that manufacturers design appliances in such a way that waste batteries and accumulators can be readily removed. Appliances into which batteries and accumulators are incorporated shall be accompanied by instructions showing how they can be removed safely and, where appropriate, informing the end-user of the type of the incorporated batteries and accumulators. These provisions shall not apply where, for safety, performance, medical or data integrity reasons, continuity of power supply is necessary and requires a permanent connection between the appliance and the battery or accumulator. all identifiable batteries and accumulators collected in accordance with Article 8 of this Directive or with Directive 2002/96/EC undergo treatment and recycling through schemes that comply, as a minimum, with Community legislation, in particular as regards health, safety and waste management. However, Member States may, in accordance with the Treaty, dispose of collected portable batteries or accumulators containing cadmium, mercury or lead in landfills or underground storage when no viable end market is available. Member States may also, in accordance with the Treaty, dispose of collected portable batteries or accumulators containing cadmium, mercury or lead in landfills or underground storage as part of a strategy to phase out heavy metals which, on the basis of a detailed assessment of the environmental, economic, and social impacts, shows that this disposal option should be preferred over recycling. Member States shall make public this assessment and notify draft measures to the Commission in accordance with Directive 98/34/EC of the European Parliament and of the Council of 22 June 1998 laying down a procedure for the provision of information in the field of technical standards and regulations and of rules on Information Society services (20). 2. Treatment shall meet the minimum requirements set out in Annex III, Part A. 3. Where batteries or accumulators are collected together with waste electrical and electronic equipment on the basis of Directive 2002/96/EC, batteries or accumulators shall be removed from the collected waste electrical and electronic equipment. 4. Recycling processes shall, no later than 26 September 2010, meet the recycling efficiencies and associated provisions set out in Annex III, Part B. 5. Member States shall report on the levels of recycling achieved in each calendar year concerned and whether the efficiencies referred to in Annex III, Part B have been met. They shall submit the information to the Commission within six months of the end of the calendar year concerned. the minimum recycling efficiencies shall be evaluated regularly and adapted to best available techniques and in the light of the developments referred to in paragraph 1, second subparagraph. 7. Before proposing any amendment to Annex III the Commission shall consult relevant stakeholders, in particular producers, collectors, recyclers, treatment operators, environmental organisations, consumer organisations and employee associations. It shall inform the committee referred to in Article 24(1) of the outcome of this consultation. 1. Member States shall encourage the development of new recycling and treatment technologies, and promote research into environmentally friendly and cost-effective recycling methods for all types of batteries and accumulators. 2. Member States shall encourage treatment facilities to introduce certified environmental management schemes in accordance with Regulation (EC) No 761/2001 of the European Parliament and of the Council of 19 March 2001 allowing voluntary participation by organisations in a Community eco-management and audit scheme (EMAS) (21). Member States shall prohibit the disposal in landfills or by incineration of waste industrial and automotive batteries and accumulators. However, residues of any batteries and accumulators that have undergone both treatment and recycling in accordance with Article 12(1) may be disposed of in landfills or by incineration. 1. Treatment and recycling may be undertaken outside the Member State concerned or outside the Community, provided that the shipment of waste batteries and accumulators is in compliance with Council Regulation (EEC) No 259/93 of 1 February 1993 on the supervision and control of shipments of waste within, into and out of the European Community (22). 2. Waste batteries and accumulators exported out of the Community in accordance with Regulation (EEC) No 259/93, Council Regulation (EC) No 1420/1999 of 29 April 1999 establishing common rules and procedures to apply to shipments to certain non-OECD countries of certain types of waste (23) and Commission Regulation (EC) No 1547/1999 of 12 July 1999 determining the control procedures under Council Regulation (EEC) No 259/93 to apply to shipments of certain types of waste to certain countries to which OECD Decision C(92)39 final does not apply (24) shall count towards the fulfilment of the obligations and efficiencies laid down in Annex III to this Directive only if there is sound evidence that the recycling operation took place under conditions equivalent to the requirements of this Directive. 3. Detailed rules for the implementation of this Article shall be laid down in accordance with the procedure referred to in Article 24(2). the collection, treatment and recycling of all waste industrial and automotive batteries and accumulators collected in accordance with Articles 8(3) and (4). 2. Member States shall ensure that the implementation of paragraph 1 avoids any double charging of producers in the case of batteries or accumulators collected under schemes set up in accordance with Directive 2000/53/EC or Directive 2002/96/EC. 3. Member States shall oblige producers, or third parties acting on their behalf, to finance any net costs arising from public information campaigns on the collection, treatment and recycling of all waste portable batteries and accumulators. 4. The costs of collection, treatment and recycling shall not be shown separately to end-users at the time of sale of new portable batteries and accumulators. 5. Producers and users of industrial and automotive batteries and accumulators may conclude agreements stipulating financing arrangements other than the ones referred to in paragraph 1. 6. This Article shall apply to all waste batteries and accumulators, irrespective of the date of their placing on the market. Member States shall ensure that each producer is registered. Registration shall be subject to the same procedural requirements in each Member State. Such requirements for registration shall be established in accordance with the procedure referred to in Article 24(2). 1. Member States may exempt producers which, relative to the size of the national market place very small quantities of batteries or accumulators on the national market, from the requirements of Article 16(1), on the condition that this does not impede the proper functioning of the collection and recycling schemes set up on the basis of Articles 8 and 12. 2. Member States shall make public such draft measures and the grounds for proposing them and notify them to the Commission and other Member States through the Committee referred to in Article 24(1). 3. The Commission shall, within six months of notification as referred to in paragraph 2, approve or reject the draft measures after having verified that they are consistent with the considerations set out in paragraph 1 and do not constitute a means of arbitrary discrimination or a disguised restriction on trade between Member States. In absence of a decision by the Commission within this period, the draft measures shall be deemed to have been approved. 1. Member States shall ensure that all economic operators and all competent public authorities may participate in the collection, treatment and recycling schemes referred to in Articles 8 and 12. 2. These schemes shall also apply to batteries and accumulators imported from third countries under non-discriminatory conditions and shall be designed to avoid barriers to trade or distortions of competition. 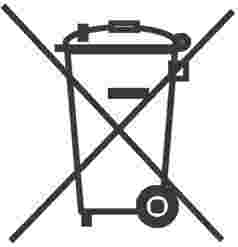 the meaning of the symbol of the crossed-out wheeled bin shown in Annex II and the chemical symbols Hg, Cd and Pb. 2. Member States may require economic operators to provide some or all of the information referred to in paragraph 1. 3. Where Member States require distributors to take back waste portable batteries and accumulators pursuant to Article 8, they shall ensure that such distributors inform end-users about the possibility of discarding waste portable batteries or accumulators at their sales points. 1. Member States shall ensure that all batteries, accumulators and battery packs are appropriately marked with the symbol shown in Annex II. 2. Member States shall ensure that the capacity of all portable and automotive batteries and accumulators is indicated on them in a visible, legible and indelible form by 26 September 2009. Detailed rules for the implementation of this requirement, including harmonised methods for the determination of capacity and appropriate use, shall be laid down in accordance with the procedure referred to in Article 24(2) no later than 26 March 2009. 3. Batteries, accumulators and button cells containing more than 0,0005 % mercury, more than 0,002 % cadmium or more than 0,004 % lead, shall be marked with the chemical symbol for the metal concerned: Hg, Cd or Pb. The symbol indicating the heavy metal content shall be printed beneath the symbol shown in Annex II and shall cover an area of at least one-quarter the size of that symbol. 4. The symbol shown in Annex II shall cover at least 3 % of the area of the largest side of the battery, accumulator or battery pack, up to a maximum size of 5 × 5 cm. In the case of cylindrical cells, the symbol shall cover at least 1,5 % of the surface area of the battery or accumulator and shall have a maximum size of 5 × 5 cm. 5. Where the size of the battery, accumulator or battery pack is such that the symbol would be smaller than 0,5 × 0,5 cm, the battery, accumulator or battery pack need not be marked but a symbol measuring at least 1 × 1 cm shall be printed on the packaging. 6. Symbols shall be printed visibly, legibly and indelibly. 7. Exemptions from the labelling requirements of this Article may be granted in accordance with the procedure referred to in Article 24(2). 1. Member States shall send the Commission a report on the implementation of this Directive every three years. However, the first report shall cover the period until 26 September 2012. 2. Reports shall be drawn up on the basis of a questionnaire or outline established in accordance with the procedure referred to in Article 24(2). The questionnaire or outline shall be sent to Member States six months before the beginning of the first period that the report is to cover. measures taken to promote waste prevention. 4. The report shall be made available to the Commission no later than nine months after the end of the three-year period concerned or, in the case of the first report, no later than 26 June 2013. 5. The Commission shall publish a report on the implementation of this Directive and on the impact of this Directive on the environment and on the functioning of the internal market no later than nine months after receiving the reports from Member States in accordance with paragraph 4. 1. The Commission shall review the implementation of this Directive and the impact of this Directive on the environment and the functioning of the internal market after receiving reports from Member States in accordance with Article 22(4) for the second time. the appropriateness of the minimum recycling requirements set out in Annex III, Part B, taking account of information that Member States provide, technical progress and practical experience gained in Member States. 3. If necessary, proposals for revision of the related provisions of this Directive shall accompany the report. 1. The Commission shall be assisted by the Committee set up under Article 18 of Directive 2006/12/EC. 2. Where reference is made to this Article, Articles 5 and 7 of Decision 1999/468/EC shall apply, having regard to the provisions of Article 8 thereof. Member States shall lay down rules on penalties applicable to infringements of national provisions adopted pursuant to this Directive and shall take all necessary measures to ensure that they are implemented. The penalties provided for must be effective, proportionate and dissuasive. Member States shall notify those measures to the Commission by 26 September 2008 and shall inform it without delay of any subsequent amendment to them. 1. Member States shall bring into force the laws, regulations and administrative provisions necessary to comply with this Directive by 26 September 2008. When Member States adopt these measures, they shall contain a reference to this Directive or be accompanied by such a reference on the occasion of their official publication. The methods of making such reference shall be laid down by the Member States. 2. Member States shall communicate to the Commission the text of all existing laws, regulations and administrative provisions adopted in the field covered by this Directive. they must be published in the national official journal or an official document equally accessible to the public and transmitted to the Commission. 2. The results achieved must be monitored regularly, and reported to the competent authorities and the Commission, and made available to the public under the conditions set out in the agreement. 3. The competent authorities shall ensure that the progress made under such agreements is examined. 4. In cases of non-compliance with the agreements, Member States shall implement the relevant provisions of this Directive by legislative, regulatory or administrative measures. Directive 91/157/EEC is repealed with effect from 26 September 2008. References to Directive 91/157/EEC shall be construed as references to this Directive. Done at Strasbourg, 6 September 2006. (1) OJ C 96, 21.4.2004, p. 29. (2) OJ C 117, 30.4.2004, p. 5. (3) OJ C 121, 30.4.2004, p. 35. (4) Opinion of the European Parliament of 20 April 2004 (OJ C 104 E, 30.4.2004, p. 354), Council Common Position of 18 July 2005 (OJ C 264 E, 25.10.2005, p. 1) and Position of the European Parliament of 13 December 2005 (not yet published in the Official Journal). European Parliament Legislative Resolution of 4 July 2006 (not yet published in the Official Journal) and Decision of the Council of 18 July 2006. (5) OJ C 30, 4.2.1988, p. 1. (6) OJ L 78, 26.3.1991, p. 38. Directive as amended by Commission Directive 98/101/EC (OJ L 1, 5.1.1999, p. 1). (7) OJ L 242, 10.9.2002, p. 1. (8) OJ L 37, 13.2.2003, p. 24. Directive as amended by Directive 2003/108/EC of the European Parliament and of the Council (OJ L 345, 31.12.2003, p. 106). (9) OJ L 114, 27.4.2006, p. 9. (10) OJ L 182, 16.7.1999, p. 1. Directive as amended by Regulation (EC) No 1882/2003 of the European Parliament and of the Council (OJ L 284, 31.10.2003, p. 1). (11) OJ L 332, 28.12.2000, p. 91. (12) OJ L 257, 10.10.1996, p. 26. Directive as last amended by Regulation (EC) No 166/2006 of the European Parliament and of the Council (OJ L 33, 4.2.2006, p. 1). (14) OJ L 184, 17.7.1999, p. 23. Decision as amended by Decision 2006/512/EC (OJ L 200, 22.7.2006, p. 11). (15) OJ L 269, 21.10.2000, p. 34. Directive as last amended by Council Decision 2005/673/EC (OJ L 254, 30.9.2005, p. 69). (16) OJ L 37, 13.2.2003, p. 19. Directive as last amended by Commission Decision 2006/310/EC (OJ L 115, 28.4.2006, p. 38). (17) OJ L 144, 4.6.1997, p. 19. Directive as last amended by Directive 2005/29/EC (OJ L 149, 11.6.2005, p. 22). (18) OJ L 377, 31.12.1991, p. 20. Directive as last amended by Regulation (EC) No 166/2006. (19) OJ L 332, 9.12.2002, p. 1. Regulation as last amended by Commission Regulation (EC) No 783/2005 (OJ L 131, 25.5.2005, p. 38). (20) OJ L 204, 21.7.1998, p. 37. Directive as last amended by the 2003 Act of Accession. (21) OJ L 114, 24.4.2001, p. 1. Regulation as last amended by Commission Regulation (EC) No 196/2006 (OJ L 32, 4.2.2006, p. 4). (22) OJ L 30, 6.2.1993, p. 1. Regulation as last amended by Commission Regulation (EC) No 2557/2001 (OJ L 349, 31.12.2001, p. 1). (23) OJ L 166, 1.7.1999, p. 6. Regulation as last amended by Commission Regulation (EC) No 105/2005 (OJ L 20, 22.1.2005, p. 9). (24) OJ L 185, 17.7.1999, p. 1. Regulation as last amended by Regulation (EC) No 105/2005. (1) Year X is the year including the date mentioned in Article 26. Treatment shall, as a minimum, include removal of all fluids and acids. Treatment and any storage, including temporary storage, at treatment facilities shall take place in sites with impermeable surfaces and suitable weatherproof covering or in suitable containers. recycling of 50 % by average weight of other waste batteries and accumulators.